Pakistan influencing the gold market of the Holy City for more than four decades since the Partition may sound strange. But it has been true. Before the erection of fencing on Punjab’s 533-km international border, Amritsar’s market, which was called the ‘Gold Home Market of India’, had mostly survived on smuggling of gold from Pakistan. Amritsar is fast becoming the most popular shooting destination for mega Bollywood, and even international, film productions. For Vinodh (30), a migrant labourer from Bihar, the waiting shed situated in front of Shaheeda Gurdwara has been the only place to spend his nights for the last more than 15 years. Vinodh is a daily wager at the nearby Raj Talkies and he serves tea to cinemagoers. He works there during the day time, but comes to spend his night under this open shed. The workshop for preparing dry flowers for use in various decorative ways was organised by the All India Women's Conference in collaboration with the National Botanical Research Institute, Lucknow. DAV International School organised its annual prize distribution function on February 25 on the school campus. 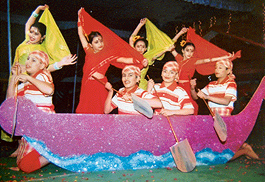 A colourful cultural programme was presented by school students. Mr Kamlesh Sharma, a philanthropist from Canada, was the chief guest. He gave away prizes to the toppers from each class. Born in a non-descript village Amargarh of Khanna, Dr Tarlochan Singh Kler has today made a mark for himself. He received the coveted Padma Bhushan award, one of the highest civilian titles, for his remarkable service in the medicine field. Two head constables of the Punjab police, Mr Dharamvir Singh, and Mr Balwinder Singh, along with their friend Sandeep Singh — all of them national players of judo, are running a judo training centre here. The Shri Ram Educational Society of Shri Ram Ashram School, which was established during the time of the Non-Cooperation Movement, has now decided to reach the weaker sections of the society and provide education to children from labour colonies. A 20-year-old artist George Dhindsa's exhibition on caricatures held recently at the Indian Academy of Fine Arts received rave reviews. Encouraged by his success, the young upcoming artist has started painting in full swing. The NGO Shakti organised its annual meet last week. The NGO has been the brainchild of Ms Lakshmi Kanta Chawla, a social worker and State Vice-President, BJP. Its office is located in the court complex. It can be described as a family counselling centre. It was not easy for Ms Chawla to start the NGO. She had been helping estranged couples, women and victims of police aggression for long. There's good news for student community. The Sri Guru Teg Bahadur College for Women, the institute with the distinction of being the only college in the walled city to offer post graduation courses to its students, would add a number of other professional courses from the next academic session. Mata Kaulan Ji Bandi Chhorr Charitable Hospital, equipped with imported equipment, became operational on February 28. Built on two acres of land at Tarn Taran Road, the hospital has been constructed by the Mata Kaulan Ji Bhalai Kendra Trust. Mr Ajaib Singh Komal, a prominent Punjabi writer from Kenya, and Dr Joginder Singh Kairon, a retired teacher from Guru Nanak Dev University, have been awarded Bawa Balwant Kavita Award and Principal Sujan Singh Galap Award, respectively, by the Sahit Vichar Kendra here. Pakistan influencing the gold market of the Holy City for more than four decades since the Partition may sound strange. But it has been true. Before the erection of fencing on Punjab’s 533-km international border, Amritsar’s market, which was called the ‘Gold Home Market of India’, had mostly survived on smuggling of gold from Pakistan. The agricultural land along ‘no man’s land’, which has no takers today, was once costlier than the urban land, as the smuggling used to be done from this route. The price of gold, quoted from here, would fix the rates in the rest of the country till the border was fenced. In those days, gold used to be cheaper in Amritsar than in New Delhi. 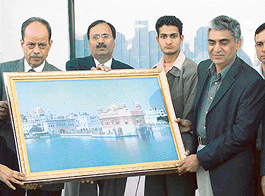 The sealing of the border had adversely affected the gold market of Amritsar. However, the announcement of bus service from Amritsar to Lahore and Nankana Sahib has again raised the hopes of local goldsmiths, who visualise the return of good old days. Even the bus service from Srinagar to Muzaffarabad from April 7 would give impetus to the local market, as the supply of Amritsar-made jewellery would be in great demand in Pakistan .The younger generation in Pakistan is crazy about such Indian products. Whenever Pakistanis visit Amritsar, they buy ornaments in bulk. 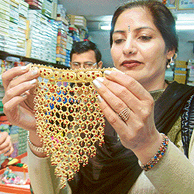 Saris, artificial jewellery and chura give them “ideal” shopping experience. Costume jewellery shops in Amritsar bring them season’s latest looks at extremely competitive prices. There is something for everyone from pre-teens to trendy twenties to women in forties and above. There is a variety of gold items from earrings to toe-rings. It is not just women that the Amritsarite jewellers cater to, in men’s section, too, there is a wide range of wrist chains, bracelets, neck chains. The Indian jewellery is considered much superior to the Pakistani products. Interestingly, craftsmen from Bengal and other parts of the country who speak chaste Punjabi mingle with Punjabi craftsmen, presenting a composite Indian culture in almost all goldsmith dominated bazaars in the city. Mr Satnam Singh Kanda, a renowned goldsmith and general secretary, Punjab Swarnkar Sang, says that Bengali craftsmen are highly paid, as they are considered very efficient. He adds that it is the availability of cheap labour that has made Amritsar one of the biggest gold markets after Mumbai and Delhi. In many cases, the whole family is engaged in making gold ornaments. However, Mr Kanda says, more than 80 per cent goldsmiths make the ornaments at nominal margins and supply them in almost all towns of the country. 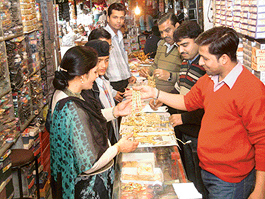 Amritsar-made jewellery has great demand in Uttar Pradesh, Maharashtra, Bihar and even South. The craftsmen use hand tools only. However, Mr Jagjit Singh Sehdev, General Secretary, Akhil Bhartiya Swarnkar Sang, apprehends that the proposed VAT (Value Added Tax) would ruin the local gold industry. He says the sale tax imposed on locally made goods is four times here than in New Delhi. The wrong policies of the Central Government could render over two lakh goldsmiths of Amritsar jobless. Amritsar’s goldsmiths are now pinning their hope on the opening of the border with Pakistan. The goldsmiths of the city link their lineage to the craftsmen from Rajasthan who had come to Amritsar when Guru Ram Dass — the founder of the city — had invited artisans of different trades to settle in the new city. Amritsar grew as a big commercial centre with markets of rice, dyes and fabrics. Ironworkers and saddlers, carpenters, blacksmiths, ivory carvers, potters, shoemakers, weavers, goldsmiths, leatherworkers, dyers and gunsmiths all made city their home. Amritsar developed well during the rule of Ranjit Singh, but after he died there was no one as strong and capable as he was. Amritsar, incidentally, is the second most industrialised city of the state after Ludhiana. It is also well known for the large variety of gold and silver jewellery produced. It has a large number of goldsmith units in the walled city. One such cluster of 100 goldsmith units is situated in Katra Hari Singh, Bazaar Batti Hattan, Katra Mohar Singh and nearby areas in the city. The individual units are very small and are located in rooms of multi-storey buildings, which house residences also. The local goldsmiths have been making ornaments in almost a hundred different designs. The designs of jewellery and the motifs carved on them have undergone many changes over the years. However, much glitter has already gone out of the lives of goldsmiths, as rich businessmen set up flashy jewellery stores all over the country following the repeal of the Gold Control Act a decade ago. The unexpected turn of the events has forced many goldsmiths to take to other professions. Interestingly, immediately after the Gold Act was repealed in 1990, businessmen who had large amounts of cash at their disposal began setting up jewellery stores. These stores were miniature versions of similar stores in the USA and other countries. They sold readymade jewellery in air-conditioned comfort. Most of their sales were in cash, ensuring handsome margins. The wide choice of designs further added to their popularity. In contrast, shops of traditional goldsmiths, engaged in the profession for several generations, did not match the glitz of the new jewellery stores. Besides, the Gold Control Act had dealt a severe blow to their finances during the 27 years that it was in existence. Unlike the new stores, they did not have readymade jewellery. They had to depend upon brass and iron samples to help their customers select the designs. It took them at least a week to create and deliver the ornaments. The craze for diamond jewellery, which was limited only to top business families, began to percolate down to upper middle class families around the time the act was repealed. The customers of traditional goldsmiths slowly crossed over to the large jewellery stores. To add to the problems, no bank offers loans to goldsmiths to help them to give a facelift to their shops. Bankers say that the goldsmiths do not have assets, which they could offer as a guarantee for the repayment of loans. Government institutions do not have any provision for offering loans to goldsmiths. More than 5000- odd persons in groups of twos and threes, armed with brooms, cleaning brushes, sieves, small-sized tubs and utensils, descend on the walled city’s Guru Bazaar, and other narrow street (which has been the centre of gold business and jewellery since the last four centuries) after the break of dawn. The early morning calm is shattered as they swoop down either to brush or collect in their metallic utensils the dry dust in front of the shutters of the closed shops. Sometimes, they scoop out the dirt and the filth from the drains with their hands and put it into the tubs they carry. The first impression that these poor shabbily-dressed men convey is that they have come to clean the place, but after watching them for hours one realises that their real task is to extract the hidden gold from the dirt and the filth. Mr Jagjit Singh Sehdev, president, Punjab Swarnkar Sang, says that these are perhaps the only bazaars where the niyarias don’t let the government sweepers enter to sweep the niyarias dust. The process to extract a few milligrams of gold dust or powder from the filth takes a few hours. The ongoing shooting of the film Rang de Basanti here is a pointer towards this. The movie is the second bi-lingual (in Hindi and English) flick to be shot here. It has the star cast of Aamir Khan, Soha Ali Khan and the immensely talented actress Kiron Kher. The film has been shot at the Golden Temple, Johal Dhai Walla village, Gharka village and the local Pir ka mela in Tarn Taran district. 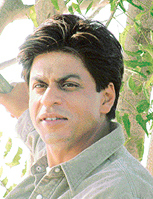 The film is the third in the series of the Bollywood mega productions. Crowds gather at the shooting sites much before the schedule, perching themselves on rooftops to take a glimpse of reel-stars in the real-life. The traffic condition, however, gets worse with narrow lanes blocked, even as the police has hard time shooing away onlookers. The top bureaucratic brass, including top police officials, is equally "starry-eyed", throwing lavish parties for the visiting stars. 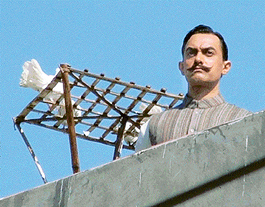 Aamir Khan, who is portraying a legendary Punjabi hero of the freedom movement, kept the crowds glued to the shooting sites at the Golden Temple, Jallianwalla Bagh and villages around the city. The city is fast attaining a global status in the film world, as a title of the UK production even carried the name of the city. Balle Balle Amritsar to LA in Hindi version brought the adaptation of Jane Austen's novel Pride and Prejudice in an indigenous mode of Bride and Prejudice by the noted UK film director of Indian origin - Gurinder Chadda. The shooting of first Bollywood film Gadar-Ek Prem Kahani in 2001 created mob hysteria that led to unfortunate death of a minor who had sustained head injuries in lathi charge resorted to by the police to control unruly crowds while the scene of the Partition exodus was being shot. But this did not dampen the spirit of other filmmakers. During the making of the film Gadar, starring Sunny Deol and Amisha Patel, director Anil Sharma said that making a period film meant recreating a slice of history. So, Amritsar station had to undergo a makeover. It was painted red. All modern electrical fitting were replaced with bulbs and fans, modern permanent structures were covered with paper and painted over. The idea was the recreate the look of the 1940s. The steam engine, especially hired from Railway Museum at Delhi with a daily rent of Rs 1 lakh, was made operational to shoot scenes. For the big budget, Bride and Prejudice, a marriage palace was converted into the house of the Bakshis of Amritsar. The movie had crowds turning out in great numbers to see Aishwarya Rai, Hollywood actor Martin Henderson, Namrata Shirodkar, Isha Kopikar. The movie was shot at the Golden Temple, Rajasansi Airport and the Hall Gate, besides the township of Jandiala Guru and Chiddan village near here. While Gadar was perceived anti-Pakistani, a whiff of fresh air cementing the bonds of the growing Indo-Pak friendship was brought to the fore in film Veer Zara shot here by Yash Chopra. Apart from the noted film star Shahrukh Khan, Preity Zinta, Rani Mukherjee and Manoj Bajpai, the multi-starrer included Amitabh Bachchan and Hema Malini. The emotional love story had the opening sequence shot at Asia's biggest wetland Harike, near Ishar Dham Nanaksar Gurdwara. The music for Pinjar, based on a novel by Amrita Pritam, starring Urmila Matondkar and Manoj Bajpai, was released at the Wagah Border. Other movies shot here have been Additappa, a thriller by Jeet Matharu, and Asa Nu maan Watana Da of Harbhajan Mann. He says he came here from Bihar 15 years back in search of job. Though there is no protection from rain here, still he has no choice. He earns only Rs 30 daily. He has his blanket and a bed sheet, which protect him from the biting cold. "Sometimes, three to four persons in police uniform come here and search my pocket to take away my money," he alleges. The shed, which measures only 25x10 feet, caters not only to Vinodh but also to 20 others. There are other daily wagers who have no choice but to sleep on benches. Rana Partap (54), a resident of Harchowal village (Gurdaspur) whose elder brother, Mr Baldev Raj Julka, a shopkeeper, was shot dead by militants in the year 1992, too, takes shelter here at night. He keeps his bedding - one blanket and a bed sheet - at the nearby tea stall after night. He is a daily wager. He has been spending his nights here for the last more than 10 years. Similar is the fate of Billa (42), a resident of Batala. He, too, is a daily wager. He is married and has four kids. He often takes shelter under this shed. After four to five days, he goes to his home. One Amarjit Singh (55), a resident of Chabal village, often stays here whenever he misses the bus. The workshop for preparing dry flowers for use in various decorative ways was organised by the All India Women's Conference (AIWC) in collaboration with the National Botanical Research Institute, Lucknow. The two-day workshop conducted by Mr S.K. Datta, Coordinator and Head, Botanical and Floriculture Department of Lucknow Institute, aimed at opening new vocational avenues, especially for rural women. During the workshop, the participants were taught the technique of dehydrating flowers, leaves, herbs, stems and other parts of the plant or the tree, so that the original colour and the fragrance were retained. The participants were told that flowers like marigold, roses could be preserved thus and used for making greeting cards, gift adornments and landscapes. These could also be used for three-dimensional interior decoration objects such as paper weights and lamp shade stands, decorative glass modules and dining table bottles. Mr Datta stated that the demand for dry flowers was booming in the world market and a comprehensive network for the export of these flowers was on the anvil. He said the government had also proposed to offer loans and other incentives to entrepreneurs for taking up the art of using dry flowers. The workshop also elaborated on using indigenous natural solar methods in case of absence of heating oven for the purpose of artificial drying. Ms Ranjit Chatha, president, AIWC, addressing the participants said the AIWC would extend help to any woman who intended to take up the vocation. Guru Gobind Singh Khalsa College, Sarhali, stood first in the commerce quiz, while the Shahzadanand College for Women and DAV College bagged the second and the third positions, respectively. The quiz and declamation contests on computer and commerce subjects were organised by Tercentenary Guru Gobind Singh Khalsa College here on February 24. In the computer quiz, the Hindu Institute of Management and Information Technology bagged the first place, while Guru Gobind Singh Khalsa College, Sarhali, and S. L. DAV College, Batala, were the second and the third, respectively. In the declamation contest on commerce BUC College, Batala, and in declamation competition on computer, R.R Bawa DAV College, Batala, bagged the first positions. Dr Hardip Singh, Head of Computer Department, Guru Nanak Dev University, was the chief guest. Ms Kailash Puri, an eminent NRI writer in Punjabi, famous social and cultural activist known as "agony aunt" in Britain, addressed teachers and students of the Khalsa College for Women on February 24. She shared her views on many problems related to the modern society and culture and their impact on women and children in India and abroad. 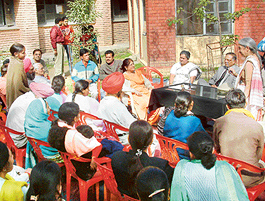 Shree Lakshmi Narayan Ayurvedic College and Hospital organised two-day free medical camp from February 28. In the camp, medical specialists in arthritis, skin, gynaecologists, paediatricians, ENT were available. For the treatment of joint disorders, paralysis, allergies and migraine, the panchkarma therapy was given. Free medicines were also distributed. Dr Satinder Singh Noor, a noted Punjabi critic and poet, addressed the postgraduate students of the Punjabi Department of the Khalsa College for Women. The winner of the Sahit Akademi Award-2004 for his book Kavita Di Bhoomika, Dr Noor spoke on how the theories of Aristotle and Bharat Muni were used in analysing the Punjabi literature. As many as ten students of M. Sc (Physics) Part-II of Khalsa College led by Dr Taminder Singh, lecturer, visited BARC, Mumbai. The group was trained in radio chemistry by a team of BARC comprising Dr Sarabjit Singh and Dr A. Ramaswamy. The students performed experiments regarding alpha, beta, and gamma radiations using surface barrier analysis spectometer. The students visited various nuclear reactors, including DHRUVA, CIRUS and APSARA, Food Irradiation and Processing Laboratory (FIPLY), Vande Graff Generator and ISOMED Laboratory. The second dastarbandi samagam of the Akaal Purkh ki Fauj concluded at the Golden Temple on February 26. On the occasion, Sikh scholars spoke on the significance of dastar (turban) in the Sikh religion. Kirtani jathas presented religious songs on the occasion. One Amandeep Singh, a resident of Gaddorazada village here, in an affidavit, has alleged that he was defrauded by a travel agent from a private travel agency. In the affidavit, he stated that he had applied for a visa for New Zealand in January 2004. He alleged that the travel agent approached him and assured him of providing a valid visa. He added that the alleged accused presented his (Amandeep Singh's) case as a married man by showing false marriage certificate without his consent. He said he was sponsored by a relative residing in New Zealand. He alleged that due to the travel agent's fraud, his future had been spoiled. He urged the authorities concerned to provide him justice. Dr Kler is Director, Cath Lab, and Head of Cardiology and Anaesthesia Services, Escorts Hospital. He says the bestowing of the prestigious award on him has convinced persons coming from remote and not-so-good background that hard work and dedication could help people to reach the zenith of their career. Dr Kler says he did not know who recommended his name for the coveted prize. In childhood he had a desire to become an engineer. It was while studying at Government High School, Kakrala Kalan, that he decided to make his future in medicine under the guidance of an able and upright teacher, Mr Bakhshish Singh. Talking about his teacher's contribution to his career, Dr Kler says, "My teacher used to come on bicycle. He took extra classes without charging even a penny." Mr Bakhshish Singh asked his pupil to become a doctor. Like a good pupil of a dedicated teacher, Dr Kler followed his teacher's words religiously. Besides studying in the PGI, he also took education from the UK and the USA. It gave him enough exposure to the advanced developments taking place in the developed countries. He was the pioneer in not only establishing the state-of-art Electro Physiology Department, Escorts Hospital, but also in implantation of the ICD in the country. He was the first to implant a biventricular pacemaker in South East Asia in 2000. For the first time, he launched radio frequency ablation programme in Sri Lanka and Bangladesh. Two head constables of the Punjab police, Mr Dharamvir Singh, and Mr Balwinder Singh, along with their friend Sandeep Singh — all of them national players of judo, are running a judo training centre here. The most interesting part is that they are running the centre by pooling their own resources. Their endeavour has brought marvellous results in a short span of two years, as the centre has produced two international and three national women players, and five national men judokas. In the last year's Senior National Judo Championship, women players from the centre clinched four medals, including two gold, one silver and a bronze medal. There was hardly any monetary help for these young judo buffs. To buy mats worth Rs 1 lakh for the training centre, they fell short of Rs 25,000. Mr Dharamvir sold his motorbike to meet the expenses for buying the mat. Dharamvir, a national player of judo, said all of them pursued the game passionately and wanted to create conducive environment for budding players. The search for a place for running the centre was an uphill task for them. Sandeep Singh said initially they began practising at Guru Nanak Stadium, but later they were forced to leave the place. Their search ended when Mr Angrej Singh, a teacher of physical education at Government School, Town Hall, offered them a hall room in the school building. Presently, as many as 30 boys and 10 girls are honing their judo skills at the centre. The centre does not charge any fee from the players, but one can contribute for buying the equipment. Sandeep Kaur (21), a player who got her training at the centre and clinched gold in the Senior National Judo Championship last year, said training at the centre had given her a winning edge. She secured silver medal in the senior national held in Lucknow in 2002. Another player Pawandeep Kaur (20) clinched gold medals in the senior national and the national games last year. Harpreet Kaur (17) and Sarabjit Kaur (21) clinched silver and bronze in the senior nationals-2004. Social activist Brij Bedi, while lauding the contribution of the judo centre, said, "It has been noticed that in our country a person excels in games largely due to his individual efforts." The school, which was one of the worst-affected schools during the heydays of terrorism, would from April 1 impart education to children who cannot afford the cost of even elementary education. The management would also give free uniforms, books and daily refreshment to the students. The school was established in 1923 with a mission to provide quality education to inculcate the spirit of nationalism among students. It was the time when national leaders had given a call to start schools and colleges without any assistance from the British government. The foundation of the present school building was laid by Dr S. Radhakrishnan, the then-vice-president of India on February 12, 1955. The school was ranked one of the best schools of Amritsar at that time. The school fell on bad days during the peak of militancy, when it was forcibly occupied by a group of persons. The managing committee led by its president, Dr Harbilas Rai, fought tooth and nail to repossess the school. Again, the school was taken over by district administration, and management had to wage a legal battle to finally retrieve the school. The strength of students decreased from several thousands to a few hundreds during these 11 years. Mr S.N. Joshi, advisor to the Shri Ram Ashram Educational Society, while talking to this correspondent, revealed that the school would also make arrangements for the transport of children. He said as it was somewhat difficult to pursue parents to send their wards to school, various teams from the school were motivating parents about the importance of education. He said they were making the lists of children so that they could be provided with books and uniforms. He said that no government aid was being taken and no donation or capitation fee would be charged from the students. The school would start initially with 100 children, who would be taught in evening. The children would be provided refreshment with bananas and a glass of milk, Mr Joshi added. Agonised over the separation of his parents at an early age, George took to sketching for his catharsis. Surprisingly, apart from clarity, colours and beauty in his strokes, his paintings hold a positive message and they are devoid of malice. The young artiste, who has a state-level award to his credit, ran off from home when he was barely 12 and studying in class IV. "I left school to do odd jobs to survive. Some family friends and relatives gave me shelter. I worked as sweeper, errand boy in shops and also took up the job of a PCO attendant. 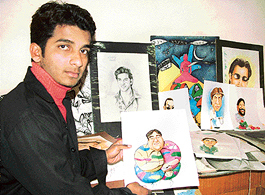 My sketches brought smiles on faces," says the self-made artiste. His recent display included nearly 30 caricatures of famous personalities, including Shahrukh Khan, Sonia Gandhi, Kapil Dev, Sachin Tendulkar, Aamir Khan and Dr Manmohan Singh. Other than cartoons, the artiste has done wide-ranging serious work in oil depicting the plight of women. The first recognition of his works came in 2001. Though into singing as well, his only aim is to secure admission in a reputed art college and pursue painting. The NGO Shakti organised its annual meet last week. The NGO has been the brainchild of Ms Lakshmi Kanta Chawla, a social worker and State Vice-President, BJP. It came into being in 1988. Its office is located in the court complex. It can be described as a family counselling centre. It was not easy for Ms Chawla to start the NGO. She had been helping estranged couples, women and victims of police aggression for long. However, she did not have a permanent platform to make their voice heard at the highest echelon of power. So, she decided to constitute a social organisation. She approached the then-DGP Punjab, Mr K.P.S. Gill, with the idea. He immediately accepted it. The effort proved successful and it was gradually implemented in the state. Ms Chawla informed that besides five women police personnel, ten activists from diverse fields were helping in the task. She said their priority was to bring the fighting parties together and solve the matter amicably. The NGO also took up cases after learning about them from media. For some persons like Mr Kashmir Singh, Shakti has been a good help. This father of five, including three daughters, was crestfallen when his second daughter Manpreet had to seek divorce after two years of marriage. Thanks to Shakti, there was no long-drawn-out court case, and it took just five months to secure the divorce. The college that was established merely 15 years back boasts of being unaided from any outside resource. Having strength of more than 2000 students, mostly from lower middle class families, the college has been doing well. Mr Nanak Singh is the founder principal of the college. The Charitable hospital has specialists in ENT, dermatology and orthopaedics. Besides, it has a special de-addiction centre with ten rooms. It also has a testing laboratory and Italian devices like ultra sound and X-ray. Bhai Guriqbal Singh, chief of the trust, said two days' medicine would be given to patients for a nominal charge of Rs 5. The annual awards are given to literary persons for their invaluable contribution to the literary world. Mr Ajaib Singh Komal, who hails from a village in Hoshiarpur district, has written approximately 50 books of poetry and plays after his return to the native state. Dr Joginder Singh Kairon has written about 15 books, including three novels and six other books, besides a play. He was awarded Principal Sujan Singh Galap Award.